Phew. This book. It isn't easy reading. When I bought it, I didn't even know that it was about an extreme case of bullying. 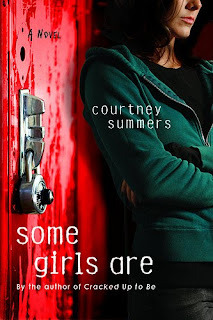 But I read and absolutely loved Courtney Summers' first book, Cracked Up to Be, and bought Some Girls Are on that alone. 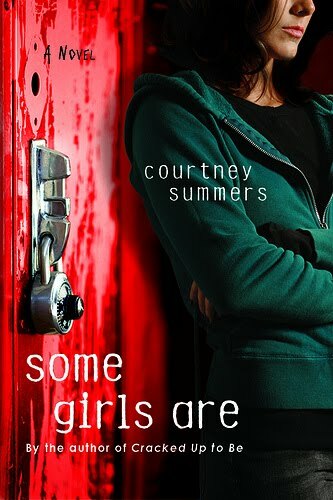 This is the perfect book to have read for Anti-Bullying Week and I have to applaud Courtney Summers for this astonishing and heartbreaking book. How did she do it? Regina Afton shouldn't be a character that is likeable. She used to be part of the popular group of Mean Girls at school. She didn't mind tearing down other people, bullying them, starting vicious rumours, all to get ahead and hold some power, be friends with the other mean girls and especially their leader, Anna. Regina fully admits to doing a lot of horrific things and some things she feels guilt over, some she really, really doesn't. And yet, I cried my heart out for Regina whilst reading this book. When I started, the book felt very similar to Speak by Laurie Halse Anderson. Regina is at a party, there is a sexual assault and afterwards, Regina is shunned by her former friends and becomes an outcast. But there's where the similarities end. Some Girls Are is taken to a level of extreme bullying that I found incredibly difficult to read. Regina is sexually assaulted by her best friend's boyfriend and in desperation, Regina turns to her sworn enemy, Kara, for help, thinking, incorrectly, that Regina would be met with compassion and understanding. Instead, Kara twists the information around and leads Anna to believe that what happens between Regina and Donnie is consensual. Thus begins an absolute nightmare of abuse. Anna, Kara and their clique of girls have no limits as to how far they will go to take Regina down. Phsycial abuse, rumours, vandalism, destruction of property, a nasty website, even a push down some stairs. And Regina endures it all. She must hide in storage cupboards and sit at the table with the losers and walk down those school corridors with no one supporting her. The teachers, the principal, Regina's parents - nobody's eyes seem to be open enough to see how much torment Regina goes through. In fact, nobody at the school wants to stand up for Regina after the damage and rumours that she's caused and started. Her only solace comes in the most unlikeliest of sources - Michael, the boy who is an absolute loner and outcast, and he is in that position because of the rumours that Regina started. Regina and Michael start out as two outcasts sharing the same lunch table, but from there begin a very fragile relationship that could splinter and break at any moment because of their shared history of tormentor and victim. What I loved most about Some Girls Are is the complexity of the characters - Regina, Michael, Anna and Kara. Nothing is as it seems with these people. They each have their own own histories that have led them to choosing the actions and behaviours that they have adopted. And especially in Regina's case, it's a very emotional journey throughout this book. Regina is suffering a great deal, both with her horrifying experience with Donnie but also the treatment of her former friends. Her exclusion from absolutely everything causes Regina to lose all hope and pin everything on her chances of a friendship with Michael. Forgiveness. Regina is eaten up by guilt for the things that she has done and it couldn't have been more painful to read. I heaved great big sloppy sobs reading Some Girls Are. Some Girls Are is an important book to read. Through the difficult subject matter, it sheds a light on both the cruelty of people, but also on the fragility and strength of the human spirit. The capacity of forgiveness and friendship. I loved the book's messiness, it's grittiness and it's complexity. Not everything is resolved at the end, nobody is perfect and each character is still flawed and damaged by the events that occurred. I'm really glad to have read this book. It sounds like an amazing and extremely emotional book. Thanks for the brilliant review. This sounds like a raelly great book! 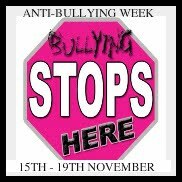 Great to see that you take part in this anti-bullying week, it is a great initiative and put spotlight on a really important topic! Thanks for the review. Emma - It is both amazing and emotional! Quite hard to read, but worth it. Thank you for a wonderful and thought-provoking review! Luisa - you're welcome. I thank Courtney Summers for doing such a great job of this one! this does sound like a rather gritty read, though I wonder if it might be too emotional for me. I know how important these books are that deal with bullying and they really should be made more readily available in secondary schools especially for the older kids. Vivienne - It is quite emotional and very difficult to read. But like you said, still very important to read. I would like to see it in secondary schools! But I'm not sure that it's widely available here in the UK? This book is phenomenal. Definitely not an easy read as it takes you on an emotional roller coaster ride. Loved it a lot though and I think it addresses a serious subject very well and honestly. This definitely sounds like a difficult but worthwhile book. Rumour and bullying make so angry, and anything that makes people stop and think about their actions has to be worth reading. What a beautifully written review. It's funny, this is one of the books that I've always been scared to read, mostly because the theme of the book hits so close to home and seem almost too harrowing to endure. Your thought-provoking and insightful review has made me decide to give this one ago. After all, if I can be taken out of my comfort zone with Forbidden, then why not with this one too, right?